Meditation is a way to make the mind more stable and clear. From this point of view, meditation is not purely a Buddhist practice; it’s a practice that anyone can do. It doesn’t tie in with a particular spiritual tradition. If we want to undo confusion, we’re going to have to be responsible for learning what our own mind is and how it works, no matter what beliefs we hold. The word for meditation in Sanskrit is “shamatha” in Sanskrit (Tibetan: shi-ne), which means “peacefully abiding.” Peacefully abiding describes the mind as it naturally is. The word “peace” tells the whole story. The human mind is by nature joyous, calm and very clear. In shamatha meditation we aren’t creating a peaceful state——we’re letting our mind be as it is to begin with.This doesn’t mean that we’re peacefully ignoring things. It means that the mind is able to be present, without constantly leaving. 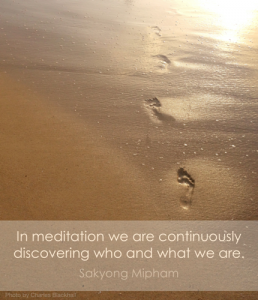 In meditation, what we’re doing is looking at our experience and at the world intelligently. The Buddha said that this is how we learn to look at any situation and understand its truth. This is what a Buddha does—and we are all capable of being Buddhas, whether or not we are Buddhists. We all have the ability to realize our naturally peaceful minds where there is no confusion. We can use the natural clarity of our mind to focus on anything we want. But first we have to tame our minds through shamatha meditation. Perhaps we associate meditation with spirituality because when we experience a moment of peacefully abiding, it seems so far-out. Our mind is no longer drifting, thinking about a million things. The sun comes up or a beautiful breeze comes along—and all of a sudden we feel the breeze and we are completely in tune. We think, “That’s a very spiritual experience! It’s a religious experience! At least worth a poem, or a letter home.” Yet all that’s happening is that for a moment we are in tune with our mind. Our mind is present and harmonious. Before, we were so busy and bewildered that we didn’t even notice the breeze. Our mind couldn’t even stay put long enough to watch the sun to come up, which takes two-and-a-half minutes. Now we can keep it in one place long enough to acknowledge and appreciate our surroundings. Now we are really here. In fact, this is ordinary. Meditation is based on the premise that the natural state of the mind is calm and clear. It provides a way to train our mind to settle into this state. Our first reason for meditating might be that we want some freedom from our agitated mind. We want to discover the basic goodness of our natural mind. To do this requires us first to slow down and experience our mind as it is. In the process, we get to know how our mind works. We see that wherever the mind is abiding—in anger, in desire, in jealousy, or in peace—that is where we also are abiding. We begin to see that we have a choice in the matter: we do not have to act at the whim of every thought. We can abide peacefully. Meditation is a way to slow down and see how our mind works. The untrained mind is like a wild horse. It runs away when we try to find it, shies when we try to approach it. If we find a way to ride it, it takes off with the bit in its teeth and finally throws us right into the mud. There is potential for communication and rapport between horse and rider, between mind and self, but the horse needs to be trained to be a willing participant in that relationship. We train our minds with shamatha practice, the most simple form of sitting meditation. Shamatha is a Sanskrit word that means “peacefully abiding.” Like all types of meditation, it rests upon two basic principles, known in Tibetan as ngotro and gom. Ngotro refers to “being introduced” to the object of meditation, while gom is “becoming familiar.” In shamatha practice, we are introduced to and become familiar with the simple act of breathing. This is our object of concentration, the place we return to again and again when the mind has run off and we find ourselves clutching the horse’s neck, hoping we won’t end up too far from home. The untrained mind is weak and inflexible. It lives in a zone of comfort.When the boundaries of that zone are challenged, it reacts by becoming more rigid. In contrast, the trained mind is strong, flexible, and workable. Because it can stretch beyond where it feels comfortable, it’s responsive—not reactive—to challenges. Through shamatha we can train our mind to be flexible and tuned in to what’s happening now. We can apply this workable mind in all aspects of our lives, including our livelihood, our relationships, and our spiritual path. So another reason to meditate is to develop a strong, supple mind that we can put to work. The basic premise of shamatha meditation is “not too tight, not too loose.” This holds true in every aspect of the practice—finding the right environment, preparing our body and mind to meditate, holding our posture, noticing thoughts and emotions, and bringing our minds back to the breath. The instructions are very clear and we should follow them as precisely as possible. Gentleness is also necessary, or else meditation becomes a way in which we’re trying to measure up against a hopeless ideal. It’s important not to expect perfection or get hooked on the finer points of the instruction. The practice takes consistent effort, and it can also be joyful. One of the simple things that we can do is to create a good environment for practice—a place that is comfortable, quiet, and clean. A corner of your room that feels uplifted and spacious and private is a good enough place. It’s unproductive to get caught up in chasing your idea of the perfect place to meditate. Some people from the city will go into the mountains to meditate in peace and find that the crickets and the birds won’t shut up! Timing is also important. Decide on a regular time to practice each day and try to stick with it. A ten-minute period in the morning is a good place to begin.The more consistent you can be in keeping to the routine, the better. Planning is another element. It’s better not to just sit down and hope for the best. If you plop down on your seat straight from the office or right after an argument, you may spend the whole session trying to slow down enough even to remember that you’re meditating. If you’re agitated, a slow walk might be in order. If you’re drowsy, a cool shower before beginning the session might help. It can be inspiring to read a little about meditation first as a reminder of why you’re practicing. Working with ourselves in ways like this is intelligent and honest and can create the proper mind and body for good practice. But remember, preparation is not meditation, it is just preparation. Half of the challenge of meditation is simply getting to your seat. At the beginning of a session you may suddenly discover that you have more important things to do—housework or phone calls to make or e-mails to write. One way to work with this kind of procrastination is to build a routine around preliminary stretching or walking before your session. This gives you a way to ease into it by softening your body and mind before you begin meditating. The more regularly you practice the better you’ll get at working with the strategies that the untrained mind cooks up to keep you from making it to your seat. Our minds usually jump wildly from thought to thought. We replay the past; we fantasize about the future. In meditation we take an upright posture, place our mind on an object, and keep it there. In shamatha meditation, the object is the simple act of breathing. The breath represents being alive in the immediacy of the moment. When you sit down, take a balanced, grounded posture to allow the energy in the centre of your body to move freely. If you’re on a cushion, sit with your legs loosely crossed. If you’re in a chair, keep your legs uncrossed and your feet flat on the floor. Imagine that a string attached to the top of your head is pulling you upright. Let your body settle around your erect spine. Place your hands on your thighs, in a place not so far forward that it begins to pull your shoulders down, nor so far back that the shoulders contract and pinch the spine. The fingers are close and relaxed—not spread out in a grip, as if you can’t let yourself go. Tuck your chin in and relax your jaw. The tongue is also relaxed, resting against your upper teeth. Your mouth is ever so slightly open. Your gaze is downward, with the eyelids almost half shut. The eyes aren’t looking; the eyes just see. It is the same with sound—we aren’t listening, but we do hear. In other words, we’re not focusing with our senses. The basic technique is that we begin to notice our breath. The breath is what we’re using as the basis of our mindfulness technique; it brings us back to the moment, back to the present situation.The breath is something that is constant—otherwise it’s too late. Using the breathing as the object of meditation is especially good for calming a busy mind. The steady flow of the breath soothes the mind and allows for steadiness and relaxation. This is ordinary breathing; nothing is exaggerated. One simple technique is to count the in-and out-cycles of breathing from one to twenty-one. We breathe in, and then out—one. In and then out—two. Place your mind on the breathing and count each cycle of breath. You can drop the counting when your mind is settled. When your focus is wavering, check your posture. Bring yourself back to the upright position. Imagine the string pulling your spine up straight and relax your body around it. Slouching impairs your breathing, which directly affects the mind. If you slump, you’ll be struggling with your body at the same time that you’re trying to train your mind. What you want to be doing is the opposite: synchronizing your body and mind. As you focus on the breath, you’ll notice that various thoughts and emotions arise. When this happens, acknowledge that you are thinking and return your focus to the breath. In focusing you are bringing yourself back to attention. You are centering yourself in your mind and placing that mind on the breath. You are slowly settling. You’re gradually slowing the mind. When you first begin to meditate, the movement of thoughts may feel like a rushing waterfall. But as you continue to apply the technique of recognizing thoughts and returning your focus to the breath, the torrent slows down to a river, then to a meandering stream, which eventually flows into a deep, calm ocean. How we tame the mind is by using the technique of mindfulness. Quite simply, mindfulness is complete attention to detail. We are completely absorbed in the fabric of life, the fabric of the moment. We realize that our life is made of these moments and that we cannot deal with more than one moment at a time. Even though we have memories of the past and ideas about the future, it is the present situation that we are experiencing. The practice of mindfulness is the practice of being alive. When we talk about the techniques of meditation, these are techniques of life. Meditation is not about something that is separate from us. We are not trying to get into some kind of higher state of mind. The present situation is completely available, spontaneous and unbiased, and that we can see it that way through the practice of mindfulness. When we begin to meditate, the first thing we realize is how wild things are-how wild our mind is, how wild our life is. But once we begin to have the quality of being tamed, when we can sit with ourselves, we realize there’s a vast wealth of possibility that lies in front of us. Meditation is looking at our own backyard, you could say, looking at what we really have and discovering the richness that already exists.Discovering that richness is a moment-to-moment process, and as we continue to practice our awareness becomes sharper and sharper. This mindfulness actually envelopes our whole life. It is the best way to appreciate our world, to appreciate the sacredness of everything. We add mindfulness and all of a sudden, the whole situation becomes alive. This practice soaks into everything that we do; there’s nothing left out. 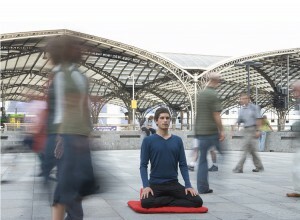 Mindfulness pervades sound and space. It is a complete experience. For the movement of the mind to slow down like this takes long, consistent practice. A good practice is one that we keep doing ten minutes a day, year after year. Through ups and through downs, slowly we become familiar with the natural stability, strength, and clarity of the mind. It becomes natural to return to that place. We let go of our conceptual ideas about it. We can relax there and enjoy it. We begin to let this natural state of basic goodness infuse our entire life. Having a mind that is at peace with itself, a mind that is clear and joyous, is the basis of happiness and compassion. Meditation practice predates Buddhism and all of the world religions. It has lasted through the centuries because it is direct, potent, and effective. If meditation becomes part of your life, please consider seeking further instruction from an experienced meditator. It might also be helpful to become part of a community of practitioners.